According to Feeding America, approximately 5.7 million different people receive emergency food assistance from the organization in any given week. To raise awareness about the national issue of hunger, Hamburger Helper® is partnering with GRAMMY® Award-winning singer, songwriter and actor Tim McGraw to help Feeding America deliver millions of meals to local food banks through the Show Your Helping HandTM campaign. McGraw will lend his voice to the campaign through a Public Service Announcement which will be distributed nationwide. Click here to view the PSA. Support the campaign by submitting codes from specially marked boxes of Hamburger Helper at www.showyourhelpinghand.com or by logging on to make a donation. 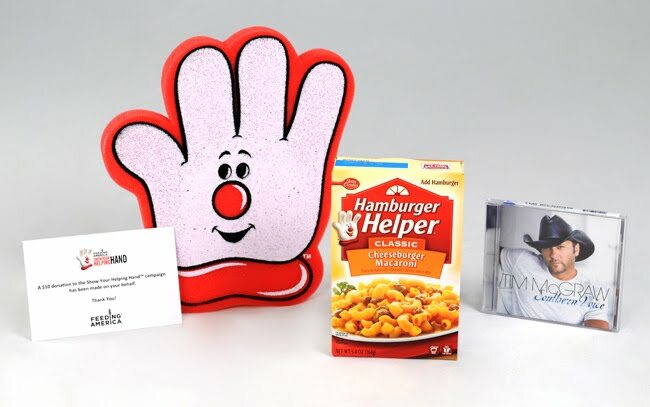 Hamburger Helper has already donated more than half a million dollars and will contribute up to an additional $100,000 to Feeding America through this program. Don´t think one code will make a difference? The 17 cents Hamburger Helper donates per code is enough for Feeding America to deliver one meal to a local food bank. Also you have a chance to win an autographed copy of Tim McGraw´s "Southern Voice" CD by visiting www.showyourhelpinghand.com. This giveaway ends 12/10/10 at 8 am. 1 winner will be picked at random.org. Please leave your email in your comment. Good Luck. Disclosure-This prize pack and information was all given to Indepedentmami from Hamburger Helper through MyBlogSpark. No compensation was received. I would show my friends where to find the codes and encourage them to submit the codes to help people who are not as fortunate.